Be part of a spectacular holiday tradition seen by 10,000 people each December! 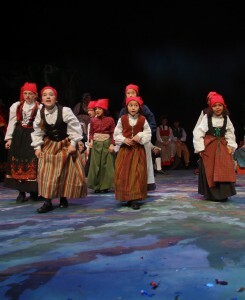 Children’s auditions for The Christmas Revels–featuring music, dance, and drama from Denmark, Finland, Iceland, Norway, and Sweden–take place on September 9 and 10, with callbacks on September 11. The Washington Revels community reflects our larger community; we therefore seek to create a diverse cast consisting of strong performers of all backgrounds and ancestries. Ability to read music helpful but not required. WHAT: Your child should prepare a short audition piece of his/her choice without accompaniment– the selection can be from any era or genre with the exception of “pop” music or show tunes. Traditional songs, carols, folk tunes, hymns, and camp songs are recommended. If your child sings in any of the five languages of the Nordic cultures, we would be happy to hear that. Read more about the Children’s Chorus and audition process. The entire audition process takes about 1 hour and includes sharing your prepared song, singing with others, movement and some group play in a low-key atmosphere. First-time auditioners – we recommend that you read the details and criteria for children on our general auditions page, contact Susan Lewis, Company Manager, at 202-257-4709 if you have any questions. You can also check out video highlights from over a decade of our previous shows on the Christmas Revels section of our YouTube page! Download audition form – please print, fill out, and bring with you to your audition appointment. Call 301-587-3835 after August 1 for an audition appointment (please read all materials above, as appropriate, before calling).